Happy New Year! I hope you had a 2018 full of lessons and milestones that helped you grow. If you're into starting your new year on a positive note, I wanted to share a couple of FREE 30 day programs I'm committing to. The best part (aside from them being free)? They can both be done from the comfort of your home. It felt too good to be true when I discovered that two of my favorite women, Adriene Mishler and Mel Robbins, were releasing programs both starting on January 1, 2019. For me, there's no better way to enter into an improved physical and mental space as I navigate my way through the next year. 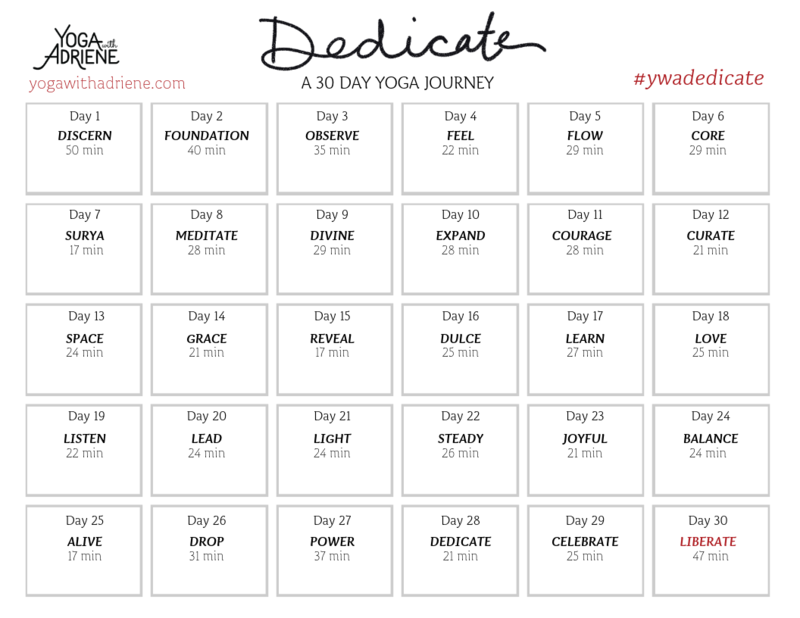 There's nothing like ​30 days of yoga with Adriene. I've done several of her 30 day programs and although it's tough at times to hop on the mat every single day, the pride and release of emotion you feel on day 30 makes it all worth it. The best thing about this program is that although it is designed to be done every day for 30 days, you can really do it at your own pace. Don't beat yourself up if you get out of sync. Adriene wouldn't want you to feel that way! She wants you to find what feels good. I like to keep myself accountable by using the calendar she provides. If you sign-up on the Dedicate webpage I linked above, you'll also get daily encouragement emails from Adriene. She's truly one of the best humans. I know you'll fall in love with her. She is the perfect teacher for an at home yoga practice. All you need for this program is access to YouTube, a yoga mat (or towel, or rug - sometimes I don't use anything! ), and some blankets or a pillow. I stumbled upon Mel Robbins on Instagram in 2018 and it was one of the best things that could have happened for me. She is a wonderful, inspirational woman who gives honest, common sense, and science-based advice on how to be a better human. Someone that believes in themselves and their ability to do anything they set their mind to. Someone that controls their mind, not allowing themselves to become a victim of it. And so much more. I absolutely love her. Joel got me her book 5 Second Rule for my birthday and my mother-in-law got me the journal that helps you apply the teachings from the book to everyday life. I will be reading the book and using the journal throughout Mindset Reset. I've been waiting anxiously to get started! You don't need the book and journal to take part in Mindset Reset. All you need is, again, access to YouTube, the Mindset Reset guidebook, and a journal. You'll want to sign-up for the program on the website I linked above so you get notified when a new video is up! Make sure to follow her on Instagram, Facebook, and Twitter as well. She shares uplifting messages everyday. If you decide to do either of these programs, let me know! I'd love to keep in touch throughout the 30 days. We could also keep each other accountable! I'm all for that. Namaste and I wish you the best in 2019!